Welcome to the one-stop shop where everything gallops. 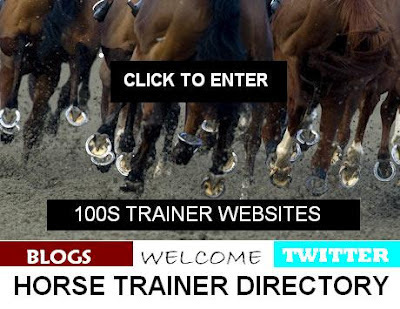 This resource details a comprehensive list of Horse Trainer Websites, Blogs & Twitter links for National Hunt & Flat racing. Take advantage of this primary source of data by clicking our ‘Quick Buttons’ to detail all the latest news. Why listen to the whispers when this comes straight from the horse’s mouth? With our website going ‘live’ we've been amazed by the response with testimonials/feedback from horse trainers, journalists, racing fans & welfare groups amongst those who have a love of everything equine. What makes our website so impressive is the ease you can navigate 100s of resources with our user-friendly features. Three simple ‘Quick button’ allow access to trainers of both codes, including our latest development the ‘Track’ facility which highlights every racecourse website & twitter link so you need never miss a day’s racing, promotions or news. Come join the community spirit by exchanging links to your equine-related websites for free. Help support your favourite charities by telling us about their work, appeals & successes promoting racing welfare. In addition, we have some wonderful deals for advertisers from a cool full page to a tiny chilled-out text link. Be spontaneous, imaginative with our brilliant new concept the Pop-Up Website for cutting-edge promotion. Don’t waste time searching the Internet high & low when the Horse Trainer Directory is the easiest way to keep you in the know. With regular updates you won’t miss a stride because we’ve gone the extra furlong. In the news! The Racing Paper - City slicker Ed's still wheeling and dealing. Ed deGiles tells Nick Townsend how he turned a City nest egg into a training career. Today’s Runners, (Friday 12th October) - The post Today’s Runners, (Friday 12th October) appeared first on Jamie Osborne Racing, The Old Malthouse, Lambourn. News from 2018 - Friday September 28th 2018 Updated news will appear very shortly…..
Open Morning - Save The Date! 12th of November at 11am. A yearlings parade, meet the team and a champagne and bacon sandwich reception. July 7 - Delighted for owners MMG Racing and the super consistent Zephyros keeping his head in front to win at Bath last night under George Wood. Trends: Comfortable Casual Wear - Mei et purto veniam suavitate, esse elaboraret no per, pri ut essent verterem accommodare. Eam ea quidam nostrum. Mull of Killough - Wintering well, aiming for a third Earl of Sefton ! Alan Jones Horses: Horses for sale - Alan Jones Horses: : "For sale 4 yo Un Named Gelding related to aaysaylad, price on application 07901 505064"
Welcome to Archie Watson, the latest trainer to join our website. Horse Trainer Directory. Great week being re-tweeted by many leading trainers including Kim Bailey, Brian Barr, Julia Feilden, to name a few. Lots of new followers on Twitter. Much appreciate everyones support. We promote UK horse trainers for FREE and keep you informed of all the latest news. Simply CLICK on the portals above (Flat, NH, Track) to open this free resource. Flat & NH feature Trainer Websites, Blogs, Twitter & Facebook pages. Don't search the net. Horse Trainer Directory does it all...Fast. All links are updated on a regular basis. Help promote Horse Trainer Directory by telling friends and race fans. Much appreciated. Horse Trainer Directory Copyright 2017. Powered by Blogger.